Dog Trainin’ takes time. It don’t matter if ya are startin’ out as a puppy, or an older dog that just wants to add more tricks he can do. Ownin’ a pet is a responsibility that shouldn’t be taken lightly and neither should trainin’ your furry friend! But, trainin’ don’t have to be hard, gruelin’ work! Trainin’ can be fun, and a bondin’ time with your human. Your human can use the helpful dog training tips below to have ya actin’ like a well trained dog in no time at all! Lemme fetch my Lady to give you 7 tips to help train your dog! 1. Positive reinforcement is essential. 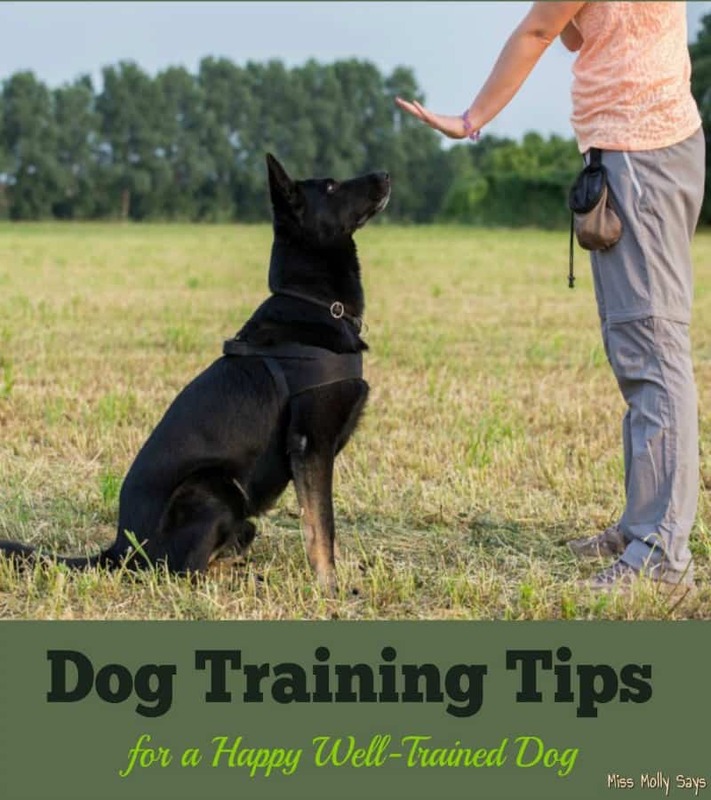 While there are many theories on how to train your dog, most dog training experts agree that positive reinforcement works the best. Positive reinforcement involves rewarding your dog with verbal praise such as “good dog”, physical praise like a pat on the head and food rewards. Positive reinforcement works cause it builds a bond of trust with your dog. Dogs are motivated by rewards, especially food rewards. In fact, you can use pieces of kibble instead of treats. Dogs don’t care and it can be cheaper and lower in calories! If you’re working with your dog on a specific skill, or trick, then try to train them at the same time every day. This helps dogs know what to expect. Most dogs thrive on structure and will perform and learn a lot faster when they know what you expect from them. Sometimes they pick up things fast and then the next day it might seem like you have to start all over again. Start each new trick with very small steps and be clear about what you expect. Keep working on it until your pup masters it. Then add a new “trick” to your pups training. 4. Use hand cues in addition to verbal cues. Some dogs have an easier time understanding and remembering hand signals than they do verbal commands. Assign a hand signal to each trick or behavior you are training. I prefer to use both a verbal and a hand signal. 5. Train in small increments. Dogs have short attention spans. So, keep training sessions to no more than five for puppies. Work your way up from there to a time limit your dog is comfortable with, but keep in mind shorter spurts is better. 6. Always end on a positive note! Learning a new trick is hard work. End each training session, no matter how frustrating, on a positive note. Give your dog a trick, or behavior, to perform that they know how to do. That way, you can end on a positive note. Give a food reward and plenty of praise. Your will ensure that your pup will be ready, and eager, for the next training session! 7. Keep your dog healthy. Finally, one of the most important dog training tips from the experts is feeding your dog a quality dog food, giving them plenty of fresh water and making sure they get enough sleep. A healthy dog is a happier dog and will learn desired behaviors a lot faster! Please don’t ever yell or hit your dog for not getting it right! It won’t help anything and could actually make it worse. It can cause your dog to be scared and have even more bad behaviors. Dogs want to please us, but sometimes it’s hard for them to understand. Be patient and help them learn. In the end, we want a happy well adjusted dog that follows commands because they love us not because they fear us! These are great tips of advice to keep in mind. To me, a dog reacts off of you. So, it’s best to be positive, patient, loving, and caring when training a pet. Thanks for sharing! These are great tips. I love to give my doggers positive reinforcement. I like the be patient one a lot too! Great tips for dog owners. I would double emphasize Consistency. So many I know go to class and never work with their dog outside of class. I don’t know what we are doing wrong. Our Goldendoodle is so smart. I have taught her to sit, shake hands, lay down, play dead, speak, sit up….Verbal and hand signals. For some reason, we cannot get her to stop pulling (hard!) on walks. We pull back, repeat “heel”, praise when she heels, say “No” when she doesn’t. She even knows to stop when we reach a curb. What gives? Help!! !